GRAMPIAN – The Bilger’s Rocks Association has announced its upcoming events for the month of April. Beginning April 20, the association will host its annual Earth Day cleanup. 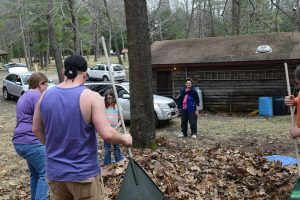 Members will be joined by boy scout troops and area residents to clean up the grounds and inside the rocks. Boy scout troops are scheduled to rebuild the community fire pit, as well as to build a storage facility for firewood. Attendees will be working on raking leaves, gathering trash and painting (weather permitted). April 27 will be the second-ever Home, Garden & Lifestyle show, and it’s scheduled from 12 p.m. – 5 p.m. This show will feature vendors displaying their products for home renovation, landscaping, gardening, outdoor living, recreation, crafts and more. According to organizers, hundreds of people from Clearfield County and the surrounding areas are expected to visit the Home, Garden & Lifestyle Show this year. Organizers say people throughout the region are attracted to attend the show with their families, because it features food vendors and activities for children, in addition to the products and services of area companies and professionals. Business owners shouldn’t miss this opportunity to reach new customers and showcase the products and services of your business.